CAT scan imaging revealed that the tip of the rostrum (snout) had been artificially reconstructed to increase its length by reassembly of portions of the maxilla on to the premaxilla. This fabrication was concealed by blocks of matrix removed from other parts of the specimen and a thick layer of IsoponTM car body filler (Martill et al., 1996). Sacrilege! But there was at least some good news, as I. challengeri was the first ever the non-avian maniraptoran described from the Cretaceous of South America, and the most complete spinosaurid skull ever found (even sans car body filler). As Cretaceous non-avian maniraptorans had only previously been found in North America and Asia, this suggested that there was an ancient land link between these regions and South America, possibly through Africa. So the irritation was well worth it, in the end! Simplified cladogram of all non-avian dinosaurs. I. challengeri was a spinosaurid, within theropoda. Moving on, the paper itself describes a fossilised paleoflamingo twig nest from the Early Miocene of Spain, containing five eggs lying in-situ (in their 'real life' position in the nest). This is the first record of a fossil avian dinosaur twig nest, due to the fragile nature of such nests normally resulting in non-preservation. So, thank you taphonomic processes that allowed for the preservation of this nest! In Figures A and B, you can see the eggshells in the nest (darker colour brown is eggshell). The dark grey material in Figure B and C is the twigs that made up the nest, and Figure D shows a tibiotarsus (lower leg bone) in cross-section from a paleoflamingo hatchling. That's exactly what it is! What better a way to re-start the Obscure Dinosaur of the Week series than with this awesome sounding creature: Hagryphus giganteus! And I'm sticking to the weekly updates, not monthly, as I want to stay ahead of the (friendly, I hope) competition. Interesting Fact: Known range of North American oviraptorosaurs doubles in size! Oviraptorosaurs have previously been found in North America (Alberta, Montana, and South Dakota). But with the discovery of H. giganteus in Utah, the area over which these theropods were known to exist doubled! It was also 30-40% larger than any of the other North American oviraptorosaurs found to date, which begs the question: what was the true palaeogeographic distribution of oviraptorosaurs in North America, and how much do they vary in size? Taphonomy, of course, has its part to play, as the record of oviraptorosaurs in North America is relatively paltry compared to oviraptorosaur fossils found in China. The previous known range of oviraptorosaurs, with the addition of the H. giganteus locality to the south, effectively doubling the known range of these dinosaurs. From Zanno et al., 2005. On a side-note, I wonder when theropod dinosaurs will stop being referred to as 'turkey-like' or 'bird-like' just because they possessed feathers: after all, birds are dinosaurs, people! I understand the need to draw comparisons to living animals, but to my ear it sounds like someone clumsily describing all apes as 'human-like'. 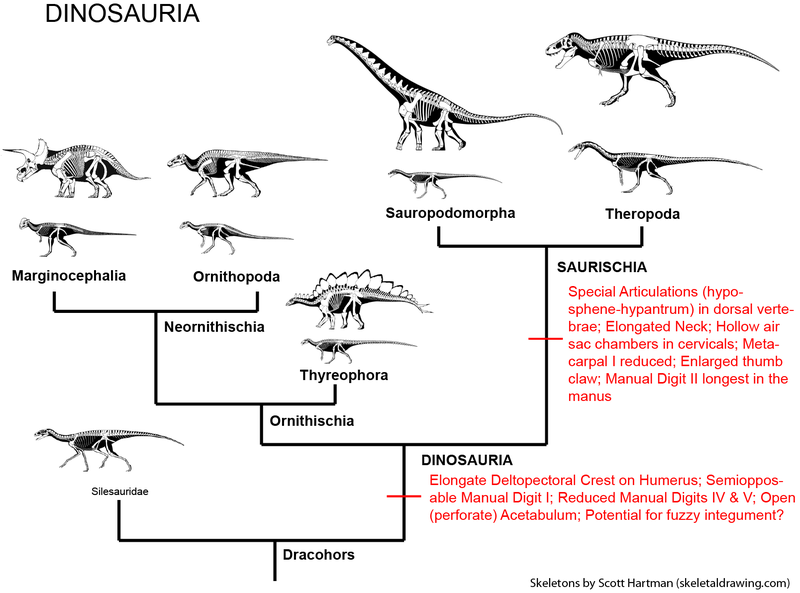 Simplified cladogram of all dinosaurs. H. giganteus was a oviraptorosaur, within theropoda. Zanno, L., Sampson, S. 2005. A new oviraptorosaur (Theropoda, Maniraptora) from the Late Cretaceous (Campanian) of Utah. Journal of Vertebrate Paleontology 25(4); 897 - 904. "It looks like a tyrannosaurus and he ate meat!" Just a quick post to say that I love seeing little kids talking about dinosaurs! I was asked if I could show a fellow UQ-er and his kids the palaeo lab. I gave them a 5 minute tour of the sauropod and ornithopod bones being prepped at the moment, casts of dinosaur footprints, and then let the kids 'dig' for some fossil bones shards in a tub of sediment. The son constantly chatted about different types of dinosaurs, and was excited to actually see some fossils up close! They seemed to enjoy it, and I did too! Palaeo Pondering: Died while sleeping? Palaeo Pondering is all about the little thoughts and questions that arise when reading the palaeo news of the day, which I'll share with you here. So today's pondering? Death poses interpreted as 'sleeping' poses. I was reading a post by Brian Switek over at Dinosaur Tracking about Mei long specimens (a basal troodontid) fossilised in a 'sleeping' position, with the head and tail curled around the body (Gao et al., 2012). I don't have an issue with this hypothesis per se, but I wondered about the possibility that they were actually curled up in a resting pose, then died, while they tried to recover from disease, trauma, or infection. The sleeping pose hypothesis posits that the animal died and was rapidly buried from a sudden event like an ash fall (similar to Pompeii). My hypothesis considers non-sudden events causing death and burial, which although requires less 'luck', does not automatically make it the most correct hypothesis. So, this may not be conclusive evidence of how dinosaurs slept, but perhaps how they rested while trying to recover from injury. It's a minor quibble, but more taphonomic and stratigraphic work needs to be done for these specimens before we can say anything conclusive about these poses (which, I should add, is also pointed out by Gao et al. (2012)). Dorsal view of the Early Cretaceous (Hauterivian-Valanginian) Mei long, discovered in the lower Yixian Formation, Liaoning Province, China (Gao et al., 2012). The backbone runs along the top of the picture, with the head near the centre, and the tail curled around to touch the head. Come and watch the first film footage of previously undescribed (and some of the largest in the world) Australian dinosaur footprints from Broome, WA! The story will be on the ABC's Catalyst program tonight at 8pm. My PhD supervisor, Dr Steve Salisbury, is featured on the show! The cultural significance of the footprints to the Goolarabooloo Traditional Custodians, as well as the scientific significance to palaeontologists everywhere, was apparently not enough to stop Woodside, the WA Government, and other Joint Venture Partners planning to build a LNG hub right on top of the trackway! They're going to destroy priceless fossils during the build, and haven't got an appropriate management plan in place if they find more fossils, only "if fossils are found, disturbance should be avoided wherever possible". Where possible. The most obvious escape clause ever written. If you'd like more information, visit the UQ Vertebrate Palaeontology and Biomechanics website. And don't worry if you miss the show, it should be on ABC's iview for at least a fortnight. I walked into the compound, and stopped to don my protective clothing including a P2 gas mask, with carbon filters to stop 'nuisance' organic vapours, a vital necessity. I pushed my way through through the plastic sheeting walling off my subjects, and stared at the passive dead eyes staring straight back at me. But something was different... something, or someone, was where they shouldn't be. I've spent the past fortnight setting up and conducting my crocodile and fish decay experiment. It was a mad rush of buying plastic tubs and glass tanks, filling them with sand and water, buying 9 bream from a fishmonger (who I'm sure would have been disappointed to hear that I didn't plan to eat them! ), collecting the humanely euthanased crocs, photographing, measuring, and weighing the crocs and fish, and finally placing them in their respective tanks. I buried some of the crocs and fish immediately, leaving the others to 'float and bloat'. Then I will bury half of those who sink after floating, and leave the other half alone. But just like a bad zombie horror novel, someone had risen from their grave. They're still dead, so I guess the zombie part isn't exactly true, but they're doing exactly what they shouldn't be doing! Alas, it was one of the buried crocodiles, bloated and floating up through a 20 cm layer of sand. "What? You were buried and floated up through 20 cm of sand WHILE DEAD? And you ate the whole wheel of cheese? How'd you do that? Heck, I'm not even mad; that's amazing!" Trying to bury it again while it's floating would be futile: like trying to bury a balloon. The plan is to drain the water out of it's tank, bury it, and put just enough water back in to wet the sediment but not allow it to float again. This means I'll also have to drain the water out of the other tanks with buried crocs/fish, so they all undergo the same conditions. It was still an interesting result, but a bit frustrating!